Given the highly competitive market in which real estate agents work, striving to attract and retain valued customers is important. 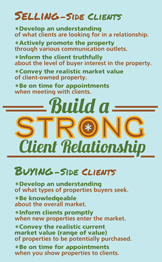 Understanding what makes a client want to leave the relationship is key to long-term agent success. Recently, a stream of research has emerged from the business-to-business sales literature examining buyer defections from suppliers and buyer intentions to stay in the relationship when multiple suppliers exist for a given product or service (e.g., Rutherford, Boles, Barksdale, Johnson 2006; 2008; Friend, Hamwi, Rutherford 2011). These studies examine customers who are already purchasing from firms and/or have alternative firms easily available to use as additional sources of supply. On the basis of these three studies, we identify the implications for the real estate agent-client context and recommend methods that real estate professionals can use to reduce both customer defections and client's perceived available alternatives. By building client satisfaction and trust, as well as increasing the perception of agent commitment, clients will experience lower levels of perceived alternatives, and agents will achieve increased levels of client retention. Client defections occur on the selling side when a client terminates the relationship and decides not to renew the listing agreement. When a client defects from the relationship, the agent's losses include the monetary expenses incurred to list the property, as well as the time lost to research the value of the property, meet with the client, and show the property. From the buying side, a defection occurs when a client decides to work with a different agent, and/or decides to look for a property outside the current agent's area and/or realm of familiarity. In either case, if the buyer decides not to continue to work with the agent, the agent loses time and money invested to show properties to the potential buyer. Client defection naturally occurs for various reasons. Some examples include: (1) the property does not receive an offer at the price the seller is willing to accept (i.e., financial reasons), (2) the seller determines that the property s/he currently owns is acceptable, and thus decides to discontinue the listing (i.e., no need), and (3) a client fails to qualify for the type/price property which he/she desires to purchase (i.e., not understanding needs). While these types of defection are important, we highlight the strategies to minimize defection due to issues specifically within the relationship between the agent and client. Clients in most real estate markets have a number of alternative real estate firms and agents from which they can choose. As the number of alternatives increases, the likelihood of client defection also increases. Based on a study of 130 business-to-business buyers of a Fortune 100 firm, we find that organizational buyers who procure from one supplier, versus from multiple suppliers, have a stronger association between satisfaction with their salesperson and propensity to stay in the relationship (Rutherford et al. 2006). Further, the study finds that buyers who procure from a single source and have a large level of perceived alternative suppliers (versus no/few alternative suppliers) place a high level of importance on satisfaction with their salesperson. Given the highly competitive real estate market for acquiring a qualified buyer or a property listing, and the large number of agents operating in most markets, making sure the client is satisfied with the relationship is absolutely crucial for reducing likelihood that the client will defect to an alternative agent. Our study prompts this challenge: Do you, as an agent, have a programmatic approach for assessing satisfaction during the selling/buying process? In another study surveying 126 business-to-business buyers of a Fortune 100 service firm, we found that as a buyer's perception of salesperson commitment increases, the buyer's propensity to stay in the relationship also increases (Rutherford et al. 2008). Further, we found that the relationship dynamics change depending on whether the buyer uses a single source or multiple sources for procurement. Specifically, buyers who engage in single sourcing are more likely to remain in the relationship as their perception of a salesperson's commitment increases. Given that most client-agent real estate relationships are single-source in nature, agents should show their clients that they are fully committed to selling the property (helping them find a new property). By doing this, the clients are more likely to reciprocate commitment by remaining with the same agent, versus searching for an alternative agent. In a third study focused on customer defections, we surveyed 229 employees who purchase from multiple competing suppliers and found that a buyer's trust in his/her salesperson reduces the buyer's perception of available alternative suppliers (Friend et al. 2011). Further, the data show that satisfaction with the salesperson, commitment to the salesperson, and a reduction of perceived available alternatives reduces the buyer's intentions to defect from the relationship. For real estate agents, this study emphasizes the importance of building a strong relationship with clients in order to reduce defection intentions. Specifically, agents should strive to show clients that they are committed to the relationship, given the impact that perceived salesperson commitment has on both satisfaction and actual commitment by the client. Further, the research highlights the impact that building both client satisfaction and client commitment has on reducing the client's defections. Finally, with the dual goal of not only reducing defections, but also reducing perceived availability of alternative suppliers, this study emphasizes the importance of building client trust in the agent. This article provides methods for real estate agents to reduce client defections through relationship-building techniques when alternative agents are available. First, agents should work to show their client(s) that they are committed to helping the client(s) meet their goals of either buying or selling a property. By building client perceptions that the agent is committed to fully serve their needs, clients will be less likely to leave the relationship for a different agent. Further, by increasing the client's perception of the agent's commitment, the client will experience a higher level of satisfaction and will be more committed to the agent. Finally, by ensuring that the client is satisfied with the relationship, the client will have higher levels of trust and, thereby will be less likely to leave the relationship. Friend, Scott B., G. Alexander Hamwi, and Brian N. Rutherford (2011), "Buyer-Seller Relationships within a Multisource Context: Understanding Customer Defection and Available Alternatives," Journal of Personal Selling & Sales Management, 31 (4), 383-395. Rutherford, Brian N., James S. Boles, Hiram C. Barksdale, Jr. and Julie T. Johnson (2008), "Buyer's Relational Desire and Number of Suppliers Used: The Relationship between Perceived Commitment and Continuance," Journal of Marketing Theory & Practice, 16 (3), 247-257. Rutherford, Brian N., James S. Boles, Hiram C. Barksdale, Jr. and Julie T. Johnson (2006), "Single Source Supply versus Multiple Source Supply: A Study into the Relationship Between Satisfaction and Propensity to Stay within a Service Setting," Journal of Personal Selling & Sales Management, 26 (4), 371-379. Dr. Brian Rutherford (PhD - Georgia State University) received his PhD from Georgia State University in 2007 and then joined the faculty at Purdue University. In 2011, he joined the faculty at Kennesaw State University. Dr. Rutherford has twenty peer-reviewed journal articles, found in journals such as the Journal of Personal Selling and Sales Management, the Journal of Business Research, the Journal of Marketing Theory and Practice and the Journal of Business and Industrial Marketing. Dr. Scott Friend (PhD - Georgia State University) became an Assistant Professor of Marketing at the University of Nebraska-Lincoln in Fall 2010. Scott's research interests are in business-to-business marketing, buyer-seller relationships, and sales management. Friend's work has been published in the Journal of Personal Selling and Sales Management and the Journal of Selling and Major Account Management. Further, Scott's dissertation, entitled "Why Are You Really Winning and Losing Deals: A Consumer Perspective on the Determinants of Sales Failures" won the 2011 American Marketing Association (AMA) Sales SIG Dissertation Award and was recognized in 2009 as the Runner-Up in the Society for Marketing Advances (SMA) Dissertation Competition. Dr. Friend has taught an array of courses at Georgia State University and the University of Nebraska-Lincoln, including Professional Sales, Business-to-Business Marketing, Marketing Research, and Principles of Marketing. Dr. Alex Hamwi (PhD - Georgia State University) became an Assistant Professor of Marketing at Missouri State University in Fall of 2009, after receiving his PhD in Marketing from Georgia State University. Dr. Hamwi's research interests include sales management, behavioral and environmental aspects of sales and ethics. Dr. Hamwi's work has been published in the Journal of Personal Selling and Sales Management, the Journal of Business Research and the Journal of Business and Industrial Marketing.